Whether you are new to the field of international development, or you are a seasoned professional, the following recommendations will inform and inspire you. We’re taking book, blog, article, podcast, and video recommendations from individuals who challenge us to think differently about development. Check back each month to see what we’re reading. For more reading recommendations, consult our Reading List for Global Citizens. 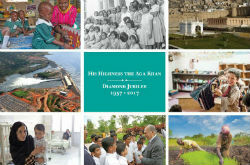 Why: This year (2017-2018) marks the Diamond Jubilee of His Highness the Aga Khan. As in many other traditions, jubilees mark important anniversaries. The Diamond Jubilee celebrations therefore represent both a recognition of the Aga Khan’s work over the last 60 years and an opportunity to launch new initiatives. This brief looks back on the significant efforts to promote pluralism and improve the quality of life for millions during six decades since the Aga Khan became Imam (spiritual leader) of the Shia Ismaili Muslims. Driven by the ethics of his faith and the Imam’s hereditary responsibility to improve the quality of life for his community and for those amongst whom they live, the Aga Khan has been at the forefront of innovation in development, as Founder and Chairman of the Aga Khan Development Network (AKDN). Each year, among numerous other interventions, the AKDN provides quality health care to five million people, improves teaching for two million students from preschool to university level, generates electricity for ten million people, and helps eight million to achieve greater food security, raise household incomes, and improve their overall quality of life. Canada and Canadians have been integral partners in the work of the AKDN for over 35 years. For anyone interested in learning more about the history of the jubilee celebrations and the work of the Aga Khan, this short overview provides a good starting point. Why: In the context of international development, ‘innovation’ is frequently over used—or ill-defined. What struck me with the initiative featured in this article were the multiple layers of innovation that contributed to a new way of tackling the quest for an HIV vaccine. First, this initiative developed new tools to enable scientists to share complex data sets drawn from research undertaken in widely different contexts. Second, it incorporated the means to learn from failure—in this case, from inconclusive or unsuccessful research results that never make it into scientific publications. Finally, as underscored by the title, the initiative drew on expertise outside the scientific research community: user experience (UX) and graphic design specialists in data visualization. Not surprisingly, the article includes a short video that frames the challenge—and the design solution—in a visually compelling way. I recommend this short read for anyone interested in exploring how the graphic presentation of information can help us explore, analyze, and communicate complex sets of data. Why: Chimamanda Adichie’s engaging and often humorous story telling of why she is a feminist, and why We Should All Be Feminists, offers both a unique and relatable perspective. She is a wonderful writer and an important spokesperson for advancing women’s rights and gender equality. Why: “The Responsible Entrepreneur is for anyone who wants to understand how businesses can combine meaningful social contribution with commercial success, to transform not only the industries in which they operate, but also the communities. Where to get it: Find it online. Where to get it:Download the report here. The views and opinions expressed in the recommended resources are those of the author(s) and do not necessarily reflect the official policy or position of AKFC.